Apus Peru > Apus Peru > Apus Peru Has a New Website! Apus Peru Gets a Facelift! Have you heard the news? Apus Peru has revamped its website! We’ve always been pioneers in the area of alternative trekking in Peru, being the first – and sometimes only – agency to offer treks in some of the most beautiful and remote corners of the Cusco region. Our website was no different, and in 2006 it was state-of-the-art. Since then, websites have evolved enormously and it was high time we kept step! The Apus Peru website was long overdue for an update, and so in 2017, plans were put in motion for a major overhaul. In a word…everything! We updated everything from the platform, to the menus, to the content! Navigating the previous website often proved a challenge. Finding information was sometimes difficult, and finding your way back even harder! Our new menu neatly organizes our treks and tours by region and by type of tour. Now you can find all of the treks we offer in each of eight Andean regions around Cusco, or search short excursions based on our interests. Whether you’re most interested in delving into history, exploring nature or experiencing local culture, you’re sure to find the best tour to make this the best possible Peruvian travel experience. But don’t worry! You can still search our treks by length. If you know you want to do a 4-day hike, you will still be able to all of our 4-day adventures, no matter where they are based, grouped in one place. Just go to Treks and scroll down the page until you see “Search by Number of Days”. 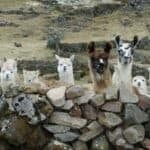 The Trekkers Wanted section of our website is jam-packed full of helpful information to help you plan your trip to Peru. Under this menu, we offer Trekking Tips, how to acclimatize to the Altitude, tips for how to choose your trek, weather info and even up-to-date advice on how to visit Machu Picchu! We’ve also made it easier for you to review our Shared Trek departures – the innovative system we call Trekkers Wanted. This is where people who have already booked a trek with us open it up to have others join them – doubling the fun, and bringing down costs for everyone! A new feature we added is our trekking Forum. This is a great resource for single travellers looking to form a group for a specific trek. Here, would-be trekkers can post their preferred dates of travel and receive messages from others who see their post and want to join. Look for new forums – like a gear swap and travel tips – coming later in 2019! With more and bigger photos – as well as some new videos – we can better show off the glorious landscapes that await you on your Peru hike. Feast your eyes on all that Peru has to offer – and tell us you don’t want to come see these magnificent sights first-hand! On each trek page, we offer a snapshot of some of the key highlights of the route, to help you make quick decisions about whether this trek is the right one for you. There is also a quick links navigation bar across each trek page where you can quickly skip down to Price, Photos, Description, Details, Itinerary or Reviews. When you’re done, click the little arrow at the bottom right hand corner of the page to be instantly taken back up to the top. The new streamlined design and simpler menu also make it easier to find the information you want. New features on like drop-down menus make it easy for you skim a page and find exactly what you’re looking for, and keeps the page looking tidy. It’s easier than ever now to get in touch with us when you’ve finally found that perfect trek, or you need a bit more information. At the top right-hand corner of each trek page, there is a simple form that you can fill out to send us a quick inquiry. And as always, our sales team will get back to you as quickly as they can – usually within 24 hours! Our whole team – from the sales team to the operations team and field staff – are so excited to have you join us in Peru. And we want you to get to know us, too! On our new Team page, you can already get to know a bit about the people you’ll be hiking with, or who are working behind the scenes to make sure your trek goes off without a hitch. And don’t forget to check out Our Story. This is where it all began! The inspiration, values and aspirations that are the foundation of Apus Peru – and which underlie everything we do, to this day.